For the 1944 film bio, see Porfirio Díaz (film). This name uses Spanish naming customs: the first or paternal family name is Díaz and the second or maternal family name is Mori. José de la Cruz Porfirio Díaz Mori (/ˈdiːəs/; Spanish: [poɾˈfiɾjo ði.as]; 15 September 1830 – 2 July 1915) was a Mexican general and politician who served seven terms as President of Mexico, a total of 31 years, from February 17, 1877 to December 1, 1880 and from December 1, 1884 to May 25, 1911. A veteran of the War of the Reform (1858–60) and the French intervention in Mexico (1862–67), Díaz rose to the rank of General, leading republican troops against the French-imposed rule of Emperor Maximilian. Seizing power in a coup in 1876, Díaz and his allies, a group of technocrats known as "Científicos", ruled Mexico for the next thirty-five years, a period known as the Porfiriato. Díaz has always been a controversial figure in Mexican history; while the Porfirian regime brought stability after decades of conflict, it grew unpopular due to civil repression and political stagnation. His economic policies largely benefited his circle of allies as well as foreign investors, and helped a few wealthy estate-owning hacendados acquire huge areas of land, leaving rural campesinos unable to make a living. Likewise these estates were often deadly, resulting in the deaths of 600,000 workers in 1900 through the end of Diaz's rule. Despite public statements favoring a return to democracy and not running for office, Díaz reversed himself and ran again in 1910. His failure to institutionalize presidential succession, as he was by then 80 years old, triggered a political crisis between the Científicos and the followers of General Bernardo Reyes, allied with the military and with peripheral regions of Mexico. After Díaz declared himself the winner of an eighth term in office in 1910, his electoral opponent, Francisco I. Madero, issued a call for armed rebellion against Díaz, leading to the outbreak of the Mexican Revolution. After the Federal Army suffered a number of military defeats against Madero's forces, Díaz was forced to resign in May 1911 and went into exile in Paris, the capital city of France, where he died four years later. 3 The campaigns of "no-reelection"
Porfirio Díaz was the sixth of seven children, baptized on 15 September 1830, in Oaxaca, Mexico, but his actual date of birth is unknown. September 15 is an important date in Mexican history, the eve of the day when hero of independence Miguel Hidalgo issued his call for independence in 1810; when Díaz became president, the independence anniversary was commemorated on September 15 rather than on the 16th, a practice that continues to the present era. Díaz was a castizo. His mother, Petrona Mori (or Mory), was the daughter of a man whose father had immigrated from Spain and Tecla Cortés, an indigenous woman; Díaz's father was a Criollo. There is confusion about his father's name, which is listed on the baptismal certificate as José de la Cruz Díaz; he was also known as José Faustino Díaz, and was a modest innkeeper who died of cholera when his son was three. Despite the family's difficult economic circumstances following Díaz's father's death in 1833, Díaz was sent to school at age 6. In the early independence period, the choice of professions was narrow: lawyer, priest, physician, military. The Díaz family was devoutly religious, and Díaz began training for the priesthood at the age of fifteen when his mother, María Petrona Mori Cortés, sent him to the Colegio Seminario Conciliar de Oaxaca. He was offered a post as a priest in 1846, but national events intervened. Díaz joined with seminary students who volunteered as soldiers to repel the U.S. invasion during the Mexican–American War, and, despite not seeing action, decided his future was in the military, not the priesthood. Also in 1846, Díaz came into contact with a leading Oaxaca liberal, Marcos Pérez, who taught at the secular Institute of Arts and Sciences in Oaxaca. That same year, Díaz met Benito Juárez, who became governor of Oaxaca in 1847, a former student there. In 1849, over the objections of his family, Díaz abandoned his ecclesiastical career and entered the Instituto de Ciencias and studied law. When Antonio López de Santa Anna was returned to power by a coup d'état in 1853, he suspended the 1824 constitution and began persecuting liberals. At this point, Díaz had already aligned himself with radical liberals (rojos), such as Benito Juárez. Juárez was forced into exile in New Orleans; Díaz supported the liberal Plan de Ayutla that called for the ouster of Santa Anna. Díaz evaded an arrest warrant and fled to the mountains of northern Oaxaca, where he joined the rebellion of Juan Álvarez. In 1855, Díaz joined a band of liberal guerrillas who were fighting Santa Anna's government. After the ousting and exile of Santa Anna, Díaz was rewarded with a post in Ixtlán, Oaxaca, that gave him valuable practical experience as an administrator. Díaz's military career is most notable for his service in the Reform War and the struggle against the French. By the time of the Battle of Puebla (5 May 1862), Mexico's great victory over the French when they first invaded, Díaz had advanced to the rank of general and was placed in command of an infantry brigade. During the Battle of Puebla, his brigade was positioned centered between the forts of Loreto and Guadalupe. From there, he successfully helped repel a French infantry attack meant as a diversion, to distract the Mexican commanders' attention from the forts that were the French army's main targets. In violation of General Ignacio Zaragoza's orders, after helping fight off the larger French force, General Díaz and his unit then chased after them. Despite Díaz's inability to cede control, General Zaragoza commended his actions during the battle as "brave and notable". In 1863, Díaz was captured by the French Army. He escaped and President Benito Juárez offered him the positions of secretary of defense or army commander in chief. He declined both, but took an appointment as commander of the Central Army. That same year, he was promoted to the position of Division General. In 1866, Díaz formally declared loyalty. That same year, he earned victories in Nochixtlán, Miahuatlán, and La Carbonera, and once again captured Oaxaca. He was then promoted to general. Also in 1866, Marshal Bazaine, commander of the Imperial forces, offered to surrender Mexico City to Díaz if he withdrew support of Juárez. Díaz declined the offer. In 1867, Emperor Maximilian offered Díaz the command of the army and the imperial rendition to the liberal cause. Díaz refused both. Finally, on 2 April 1867, he went on to win the final battle for Puebla. Five days later, Díaz married Delfina Ortega Díaz (1845–1880), the daughter of his sister, Manuela Josefa Díaz Mori (1824–1856). Díaz and his niece would have seven children, but Delfina died due to complications of her seventh delivery. When Juárez became the president of Mexico in 1868 and began to restore peace, Díaz resigned his military command and went home to Oaxaca. However, it wasn't long before the energetic Díaz became unhappy with the Juárez administration. In 1871, Díaz led a revolt against the re-election of Juárez. In March 1872, Díaz's forces were defeated in the battle of La Bufa in Zacatecas. Following Juárez's death on 9 July of that year, Sebastián Lerdo de Tejada assumed the presidency and offered amnesty to the rebels. Díaz accepted in October and "retired" to the Hacienda de la Candelaria in Tlacotalpan, Veracruz. However, he remained very popular among the people of Mexico. In 1874, he was elected to Congress from Veracruz. That year, Lerdo de Tejada's government faced civil and military unrest, and offered Díaz the position of ambassador to Germany, which he refused. In 1875, Díaz traveled to New Orleans and Brownsville, Texas to plan a rebellion, which was launched in Ojitlan, Oaxaca, on 10 January 1876 as the "Plan de Tuxtepec". Several months later, in November 1876, Díaz returned to Mexico and fought the Battle of Tecoac, where he defeated the government forces once and for all (on 16 November). Finally, on 12 May 1877, Díaz was elected president of Mexico for the first time. His campaign of "no re-election", however, came to define his control over the state for more than thirty years. As a Liberal military hero, Díaz had ambitions for national political power. He challenged the civilian president Benito Juárez, who was running for what Díaz considered an illegal subsequent term as president. In 1870, Díaz ran against President Juárez and Vice President Sebastián Lerdo de Tejada. In 1871, he made claims of fraud in the July elections won by Juárez, who was confirmed as president by the Congress in October. In response, Díaz launched the Plan de la Noria on 8 November 1871, supported by a number of rebellions across the nation, including one by Manuel González of Tamaulipas, but this rebellion failed. Following the death of Juárez of natural causes in 1872, Lerdo became president. Lerdo offered amnesty to rebels, which Díaz accepted and took up residency in Veracruz. In 1874, Díaz served in the legislature, representing Veracruz. Opposition to the presidency of Lerdo grew, particularly as anti-clericalism increased, labor unrest grew, and a major rebellion of the Yaqui in northwest Mexico under the leadership of Cajemé challenged central government rule there. Díaz saw an opportunity to plot a more successful rebellion, leaving Mexico in 1875 for New Orleans and Brownsville, Texas with his political ally Manuel González. When Lerdo declared he was running for re-election in 1876, Díaz once again had the pretext of the principle of no-reelection to support his opposition. He issued the Plan of Tuxtepec (a town in Oaxaca) as a call to arms against Lerdo. When Lerdo was re-elected in July 1876, rebellion and unrest both before and after the election forced Lerdo from office. In November 1876, Díaz occupied Mexico City, Lerdo left Mexico for exile in New York. Díaz did not take formal control of the presidency until the beginning of 1877, putting General Juan N. Méndez as provisional president, followed by new presidential elections in 1877 that gave Díaz the presidency. Ironically, one of his government's first amendments to the 1857 liberal constitution was to prevent re-election. Although the liberals had defeated the conservatives in the War of the Reform, the conservatives had been powerful enough still in the early 1860s to aid the imperial project of France that put Maximilian Habsburg as emperor of Mexico. With the fall of Maximilian, Mexican conservatives were cast as collaborators with foreign imperialists. With the return of the liberals under Benito Juárez, and following his death, liberals held power, but basic liberal goals of democracy, rule of law, and economic development were not reached. Díaz saw his task in his term as president to create internal order so that economic development could be possible. As a military hero and astute politician, Díaz's eventual successful establishment of that peace (Pax Porfiriana) became "one of [Díaz's] principal achievements, and it became the main justification for successive re-elections after 1884." During his first term in office, Díaz developed a pragmatic and personalist approach to solve political conflicts. Although a political liberal who had stood with radical liberals in Oaxaca (rojos), he was not a liberal ideologue, preferring pragmatic approaches towards political issues. He was explicit about his pragmatism. He maintained control through generous patronage to political allies. Although he was an authoritarian ruler, he maintained the structure of elections, so that there was the façade of liberal democracy. His administration became famous for suppression of civil society and public revolts. One of the catch phrases of his later terms in office was the choice between "pan o palo", ("bread or the bludgeon")—that is, "benevolence or repression." To secure U.S. government recognition of the Díaz regime, which had come to power by a coup despite the later niceties of an election after Lerdo went into exile, Mexico paid $300,000 to settle claims by the U.S. In 1878, the U.S. government recognized the Díaz regime and former U.S. president and Civil War hero Ulysses S. Grant visited Mexico. During The Porfiriato, Diaz modernized different aspects of Mexico's infrastructure, such as a tenfold increase in railways, steam-powered locomotives, and telegraph lines across the country. These improvements were mainly backed by foreign capital and were done to benefit his close supporters and foreign investors. On the other hand, Diaz showed less concern for the common Mexican people. During 1883-1894, laws were passed to give fewer and fewer people large amounts of land. Land was taken away from people by bribing local judges to declare them vacant. Díaz's friend obtained 12 million acres of land in Baja California by bribing local judges. Those who opposed were killed or captured and sold as slaves to plantations. Diaz initially served only one term — after having staunchly stood against Lerdo's re-election policy. Instead of running for a second term, he handpicked his successor, Manuel González, one of his trustworthy companions. This side-step maneuver, however, did not mean that Díaz was stepping down from his powerful position. The four-year period that followed was marked by corruption and official incompetence, so that when Díaz stepped up in the election of 1884, he was welcomed by his people with open arms. More importantly, very few people remembered his "No re-election" slogan that had defined his previous campaign. During this period the Mexican underground political newspapers spread the new ironic slogan for the Porfirian times, based on the slogan "Sufragio Efectivo, No Reelección" (effective suffrage, no re-election) and changed it to "Sufragio Efectivo No, Reelección" (no effective suffrage, re-election). In any case, Díaz had the constitution amended, first to allow two terms in office, and then to remove all restrictions on re-election. With these changes in place, Díaz was re-elected four more times by implausibly high margins, and on some occasions claimed to have won with either unanimous or near-unanimous support. Having created a band of military brothers, Díaz went on to construct a broad coalition. He was a cunning politician and knew very well how to manipulate people to his advantage. A phrase used to describe the order of his rule was pan o palo ("bread or a beating"—literally "bread or the club"), meaning that one could either accept what was given willingly (often a position of political power) or else face harsh consequences (often death). Either way, rising opposition to Díaz's administration was immediately quelled. Over the next twenty-six years as president, Díaz created a systematic and methodical regime with a staunch military mindset. His first goal was to establish peace throughout Mexico. According to John A. Crow, Díaz "set out to establish a good strong paz porfiriana, or Porfirian peace, of such scope and firmness that it would redeem the country in the eyes of the world for its sixty-five years of revolution and anarchy." His second goal was outlined in his motto – "little of politics and plenty of administration." 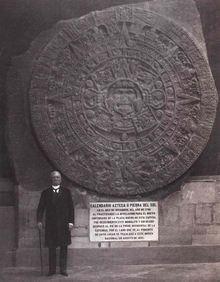 Porfirio Díaz in 1910 at the National Museum of Anthropology with the Aztec Calendar Stone. In reality, he started a Mexican revolution; however, his fight for profits, control, and progress kept his people in a constant state of uncertainty. Díaz managed to dissolve all local authorities and all aspects of federalism that once existed. Not long after he became president, the governors of all federal states in Mexico answered directly to him. Those who held high positions of power, such as members of the legislature, were almost entirely his closest and most loyal friends. In his quest for even more political control, Díaz suppressed the media and controlled the court system. In order to secure his power, Díaz engaged in various forms of co-optation and coercion. He constantly balanced between the private desires of different interest groups and playing off one interest against another. In order to satisfy any competing forces, such as the Mestizos and wealthier indigenous people, he gave them political positions of power that they could not refuse. He did the same thing with the elite Creole society by not interfering with their wealth and haciendas. Covering both pro and anti-clerical elements, Díaz was both the head of the Freemasons in Mexico and an important advisor to the Catholic bishops. Díaz proved to be a different kind of liberal than those of the past. He neither assaulted the Church (like most liberals) nor protected the Church. As for the Native American population, who were historically repressed, they were almost completely depoliticized; neither put on a pedestal as the core of Mexican society nor suppressed, and were largely left to advance by their own means. In giving different groups with potential power a taste of what they wanted, Díaz created the illusion of democracy and quelled almost all competing forces. Díaz knew that it was crucial for him to suppress banditry; he expanded the guardias rurales (countryside police), although it guarded chiefly only transport routes to major cities. Díaz thus worked to enhance his control over the military and the police. During the Díaz regime, the state began to take control over the cultural patrimony of Mexico, expanding the National Museum of Anthropology as the central repository of artifacts from Mexico's archeological sites, as well as asserting control over the sites themselves. The Law of Monuments (1897) gave jurisdiction over archeological sites to the federal government. This allowed the expropriation and expulsion of peasants who had been cultivating crops on the archeological sites, most systematically done at Teotihuacan. Former cavalry officer and archeologist Leopoldo Batres was Inspector of Archeological Monuments and wielded considerable power. He garnered resources from the Díaz government funds to guard archeological sites in central Mexico and Yucatan, as well as to hire workers to excavate archeological sites of particular importance for creating an image of Mexico's glorious past to foreign scholars and tourists, as well as patriotic fervor in Mexico. Díaz came from a devoutly Catholic family; his uncle, José Agustín, was bishop of Oaxaca. Díaz had trained for the priesthood, and it seemed likely that was his career path. Oaxaca was a center of liberalism, and the founding of the Institute of Arts and Sciences, a secular institution, helped foster professional training for Oaxacan liberals, including Benito Juárez and Porfirio Díaz. Díaz was a Freemason, which did not necessarily[clarification needed] put him at odds with the Catholic Church, but did give him access to a secret brotherhood of like-minded ambitious men. Radical liberalism was anti-clerical, seeing the privileges of the Church as challenging the idea of equality before the law and individual, rather than corporate identity. The economic power of the Church was considered a detriment to modernization and development. The Church as a major corporate landowner and de facto banking institution shaped investments to conservative landed estates more than industry, infrastructure building, or exports. When Díaz abandoned his ecclesiastical career for one in the military, his powerful uncle disowned him. Unlike many doctrinaire liberals, Díaz was not virulently anti-clerical. However, powerful liberals following the ouster of Santa Anna had moved to implement legal measures to curtail the power of the Church. The Juárez Law abolished special privileges (fueros) of ecclesiastics and the military, and the Lerdo law mandated disentailment of the property of corporations, specifically the Church and indigenous communities. The liberal constitution of 1857 removed the privileged position of the Catholic Church and opened the way to religious toleration, considering religious expression as freedom of speech. However, Catholic priests were ineligible for elective office, but could vote. Conservatives fought back in the War of the Reform, under the banner of religión y fueros (that is, Catholicism and special privileges of corporate groups), but they were defeated in 1861. Conservatives unsuccessfully tried again with the French Intervention (1862–67) to reinstate the dominance of the Church. Following the fall of the Second Empire in 1867, liberal presidents Benito Juárez and his successor Sebastián Lerdo de Tejada began implementing the anti-clerical measures of the constitution. Lerdo went further, extending the laws of the Reform to formalize: separation of Church and State; civil marriage as the only valid manner for State recognition; prohibitions of religious corporations to acquire real estate; elimination from legal oaths any religious element, but only a declaration to tell the truth; and the elimination of monastic vows as legally binding. Further prohibitions on the Church in 1874 included: the exclusion of religion in public institutions; restriction of religious acts to church precincts; banning of religious garb in public except within churches; and prohibition of the ringing of church bells except to summon parishioners. Díaz was a political pragmatist and not an ideologue, likely seeing that the religious question re-opened political discord in Mexico. When he rebelled against Lerdo, Díaz had at least the tacit and perhaps even the explicit support of the Church. When he came to power in 1877, Díaz left the anti-clerical laws in place, but no longer enforced them as state policy, leaving that to individual Mexican states. This led to the re-emergence of the Church in many areas, but in others a less full role. The Church flouted the Reform prohibitions against wearing clerical garb, there were open-air processions and Masses, and religious orders existed. The Church also recovered its property, sometimes through intermediaries, and tithes were again collected. The Church regained its role in education, with the complicity of the Díaz regime which did not put money into public education. The Church also regained its role in running charitable institutions. Despite an increasingly visible role of the Catholic Church during the Porfiriato, the Vatican was unsuccessful in getting the reinstatement of a formal relationship between the papacy and Mexico, and the constitutional limitations of the Church as an institution remained the law of the land. In Díaz's personal life, it is clear that religion still mattered and that fierce anti-clericalism could have a high price. In 1870, his brother Félix, a fellow liberal, who was then governor of Oaxaca, had rigorously applied the anti-clerical laws of the Reform. In the rebellious and supposedly idolatrous town of Juchitán in Tehuantepec, Félix Díaz had "roped the image of the patron saint of Juchitán … to his horse and dragged it away, returning the saint days later with its feet cut off". When Félix Díaz had to flee Oaxaca City in 1871 following Porfirio's failed coup against Juárez, Félix ended up in Juchitán, where the villagers killed him, doing to his body even worse than he did to their saint. Having lost a brother to the fury of religious peasants, Díaz had a cautionary tale about the dangers of enforcing anti-clericalism. Even so, it is clear that Díaz wanted to remain in good standing with the Church. In 1879, when his wife died in childbirth, he wrote a private letter to Church officials renouncing the Laws of the Reform, which allowed his wife to be buried with Catholic rites on sacred ground. When Díaz remarried in 1881, to Carmen Romero Rubio, the 17-year-old daughter of one of his advisors, Oaxaca cleric Father Eulogio Gillow gave his blessing. Gillow was later appointed archbishop of Oaxaca. Doña Carmen is credited with bringing Díaz into closer reconciliation with the Church, but Díaz was already inclined in that direction. This modus vivendi between Díaz and the Church had pragmatic and positive consequences. Díaz did not publicly renounce liberal anti-clericalism, meaning that the Constitution of 1857 remained in place, but neither did he enforce its anti-clerical measures. Conflict could reignite, but it was to the advantage of both Church and the Díaz government for this arrangement to continue. If the Church did counter Díaz, he had the constitutional means to rein in its power. The Church regained considerable economic power, with conservative intermediaries holding lands for it. The Church remained important in education and charitable institutions. Other important symbols of the normalization of religion in late 19th century Mexico included: the return of the Jesuits (expelled by the Bourbon monarchy in 1767); the crowning of the Virgin of Guadalupe as "Queen of Mexico"; and the support of Mexican bishops for Díaz's work as peacemaker. Not surprisingly, when the Mexican Revolution broke out in 1910, the Catholic Church was a staunch supporter of Díaz. Crow states, "It was the golden age of Mexican economics, 3.2 dollars per peso. Mexico was compared economically to economic powers of the time such as France, Great Britain, and Germany. For some Mexicans, there was no money and the doors were thrown open to those who had." Also, economic progress varied drastically from region to region. The north was defined by mining and ranching while the central valley became the home of large-scale farms for wheat and grain and large industrial centers. One component of economic growth involved stimulating foreign investment in the Mexican mining sector. Through tax waivers and other incentives, investment and growth were effectively realized. The desolate region of Baja California Sur benefited from the establishment of an economic zone with the founding of the town of Santa Rosalía and the commercial development of the El Boleo copper mine. This came about when Díaz granted a French mining company a 70-year tax waiver in return for its substantial investment in the project. In a similar fashion, the city of Guanajuato realized substantial foreign investment in local silver mining ventures. The city subsequently experienced a period of prosperity, symbolized by the construction of numerous landmark buildings, most notably, the magnificent Juárez Theatre. Because Díaz had created such an effective centralized government, he was able to concentrate decision-making and maintain control over the economic instability. This instability arose largely as a result of the dispossession of hundreds of thousands of peasants of their land. Communal indigenous landholdings were privatized, subdivided, and sold. The Porfiriato thus generated a stark contrast between rapid economic growth and sudden, severe impoverishment of the rural masses, a situation that was to explode in the Mexican revolution of 1910. On 17 February 1908, in an interview with the U.S. journalist James Creelman of Pearson's Magazine, Díaz stated that Mexico was ready for democracy and elections and that he would retire and allow other candidates to compete for the presidency. Without hesitation, several opposition and pro-government groups united to find suitable candidates who would represent them in the upcoming presidential elections. Many liberals formed clubs supporting the governor of Nuevo León, Bernardo Reyes, as a candidate for the presidency. Despite the fact that Reyes never formally announced his candidacy, Díaz continued to perceive him as a threat and sent him on a mission to Europe, so that he was not in the country for the elections. I have no desire to continue in the Presidency. This nation is ready for her ultimate life of freedom. Since I am responsible for bringing several billion dollars in foreign investments into my country, I think I should continue in my position until a competent successor is found. In 1909, Díaz and William Taft, the then president of the United States, planned a summit in El Paso, Texas, and Ciudad Juárez, Chihuahua, Mexico, a historic first meeting between a U.S. president and a Mexican president and also the first time an American president would cross the border into Mexico. 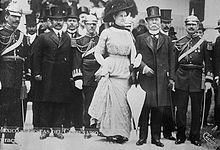 Díaz requested the meeting to show U.S. support for his planned seventh run as president, and Taft agreed in order to protect the several billion dollars of American capital then invested in Mexico. After nearly 30 years with Díaz in power, U.S. businesses controlled "nearly 90 percent of Mexico's mineral resources, its national railroad, its oil industry and, increasingly, its land." Both sides agreed that the disputed Chamizal strip connecting El Paso to Ciudad Juárez would be considered neutral territory with no flags present during the summit, but the meeting focused attention on this territory and resulted in assassination threats and other serious security concerns. The Texas Rangers, 4,000 U.S. and Mexican troops, U.S. Secret Service agents, FBI agents and U.S. marshals were all called in to provide security. An additional 250 private security detail led by Frederick Russell Burnham, the celebrated scout, were hired by John Hays Hammond, a close friend of Taft from Yale and a former candidate for U.S. 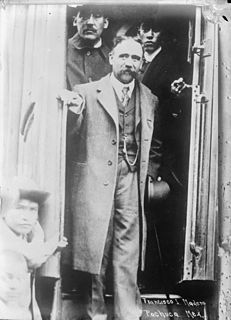 Vice-President in 1908 who, along with his business partner Burnham, held considerable mining interests in Mexico. On October 16, the day of the summit, Burnham and Private C.R. Moore, a Texas Ranger, discovered a man holding a concealed palm pistol standing at the El Paso Chamber of Commerce building along the procession route. Burnham and Moore captured and disarmed the assassin within only a few feet of Díaz and Taft. According to Crow, "A cautious but new breath entered the prostrate Mexican underground. Dark undercurrents rose to the top." As groups began to settle on their presidential candidate, Díaz decided that he was not going to retire but rather allow Francisco I. Madero, an aristocratic but democratically leaning reformer, to run against him. Although Madero, a landowner, was very similar to Díaz in his ideology, he hoped for other elites in Mexico to rule alongside the president. Ultimately, however, Díaz did not approve of Madero and had him thrown in jail during the election in 1910. Despite this, the election went ahead. Madero had gathered much popular support, but when the government announced the official results, Díaz was proclaimed to have been re-elected almost unanimously, with Madero gathering only a minuscule number of votes. This case of massive electoral fraud aroused widespread anger throughout the Mexican citizenry. Madero called for revolt against Díaz, and the Mexican Revolution began. Díaz was forced to resign in office on May 25, 1911 and fled the country for Spain six days later on May 31, 1911. On July 2 1915, Díaz died in exile in Paris, France. He is buried there in the Cimetière du Montparnasse. He was survived by his second wife (María del Carmen Romero-Rubio Castelló, 1864–1944) and two of his children (Deodato Lucas Porfirio Díaz Ortega, 1873–1946, and Luz Aurora Victoria Díaz Ortega, 1875–1965). His other five children died as infants. His widow was allowed to return to Mexico in the 1940s under the presidency of Manuel Ávila Camacho. The legacy of Díaz has undergone revision since the 1990s. In Díaz's lifetime before his ouster, there was an adulatory literature, which has been named "Porfirismo". The vast literature that characterizes him as a ruthless tyrant and dictator has its origins in the late period of Díaz's rule and has continued to shape Díaz's historical image. In recent years, however, Díaz's legacy has been re-evaluated by Mexican historians, most prominently by Enrique Krauze, in what has been termed "Neo-Porfirismo". As Mexico pursued a neoliberal path under President Carlos Salinas de Gortari, the modernizing policies of Díaz that opened Mexico up to foreign investment fit with the new pragmatism of the Institutional Revolutionary Party. Díaz was characterized as a far more benign figure for these revisionists. With the wave of anti-Americanism in 2003, the following words of Díaz were recalled[by whom? ]: "Poor Mexico, so far from God, so close to the United States." Partly due to Díaz's lengthy tenure, the current Mexican constitution limits a president to a single six-year term with no possibility of re-election, even if it is nonconsecutive. Additionally, no one who holds the post, even on a caretaker basis, is allowed to run or serve again. This provision is so entrenched that it remained in place even after legislators were allowed to run for a second consecutive term. There have been several attempts to return Díaz's remains to Mexico since the 1920s. The most recent movement started in 2014 in Oaxaca by the Comisión Especial de los Festejos del Centenario Luctuoso de Porfirio Díaz Mori, which is headed by Francisco Jiménez. According to some, the fact that Díaz's remains have not been returned to Mexico "symbolises the failure of the post-Revolutionary state to come to terms with the legacy of the Díaz regime." The main Mexican holiday is the Day of Independence, celebrated on September 16. Americans are more familiar with the Cinco de Mayo. Cinco de Mayo commemorates the date of the Battle of Puebla, in which Díaz participated, when a major victory was won against the French. Under the Porfiriato, the Mexican Consuls in the United States gave Cinco de Mayo more importance than the Day of Independence due to the President's personal involvement in the events. It is still widely celebrated in the United States, although largely due to cultural permeation. The card-game "Pax Porfiriana" (2012) has, as its theme, the competing hacendados jockeying to win out in the regime and topple Díaz. The novel All the Pretty Horses (1992) by Cormac McCarthy. Alejandra's aunt is a childhood friend of Francisco Madero. The revolution is mentioned in a monologue. The James Carlos Blake novels The Friends of Pancho Villa (1996), in which Díaz is a major character, and Country of the Bad Wolfes (2012), in which Díaz is a central character. Porfirio Díaz is referenced in chapter two of D.H. Lawrence's seminal Studies in Classical American Literature (1923), with respect to the "perfectibility of man." Michael Nava's novel, The City of Palaces" is set against the backdrop of Porfirio's presidency and the Mexican revolution. ^ Mary Kay Vaughan, "Científicos" in Encyclopedia of Latin American History and Culture, vol. 2, p. 155. New York: Charles Scribner's Sons 1996. ^ Vaughan, "Cientificos", p. 155. ^ Garza, James A., "Porfirio Díaz" in Encyclopedia of Mexico, Chicago: Fitzroy Dearborn 1997, p. 406. ^ 1948-, Meade, Teresa A.,. A history of modern Latin America : 1800 to the present (Second ed.). Chichester, West Sussex. ISBN 9781118772485. OCLC 915135785. ^ a b Buckman, Robert T. (2007). The World Today Series: Latin America 2007. Harpers Ferry, West Virginia: Stryker-Post Publications. ISBN 978-1-887985-84-0. ^ Zayas Enríquez, Rafael (1908). Porfirio Díaz. p. 31. ^ Colín, Ricardo Pacheco. "Zúñiga y Miranda, "Presidente legítimo"" (in Spanish). Retrieved 2017-01-27. ^ Zeit, Joshua (February 4, 2017). "The Last Time the U.S. Invaded Mexico". Politico Magazine. Washington, D.C.: Politico. Retrieved February 5, 2017. ^ "Gen. Diaz Departs and Warns Mexico". New York Times. May 31, 1911. Retrieved May 30, 2011. ^ webmaster.rmc (23 March 2015). "Collections & History Gallery". ^ Peter H. Merkl, The Distracted Eagle: The Rift between America and Old Europe, (Routeledge, London & New York, 2005), p 31. Garner, Paul (2001). Porfirio Díaz. Pearson. Krauze, Enrique (1987). Porfirio Díaz: Místico de la Autoridad. Mexico. López Obrador, Andrés Manuel (2014). Neoporfirismo: Hoy como ayer. Grijalbo. ISBN 9786073123266. Roeder, Ralph. Hacia El México Moderno: Porfirio Díaz. México: Fondo de Cultura Económica, 1973. Vanderwood, Paul (1970). "Genesis of the Rurales: Mexico's Early Struggle for Public Security". Hispanic American Historical Review. 50 (2): 323–344. JSTOR 2513029. De María y Campos, Alfonso. "Porfirianos prominentes: origenes y años de juventud de ocho integrantes del group de los Científicos 1846–1876", Historia Mexicana 30 (1985), pp. 610–81. González Navarro, Moisés. "Las ideas raciales de los Científicos'. Historia Meixana 37 (1988) pp. 575–83. Hale, Charles A. Justo Sierra. Un liberal del Porfiriato. Mexico: Fondo de Cultura Económica 1997. Hale, Charles A. The Transformation of Liberalism in Late Nineteenth-Century Mexico. Princeton: Princeton University Press 1989. Priego, Natalia. Positivism, Science, and 'The Scientists' in Porfirian Mexico. Liverpool: Liverpool University Press 2016. Raat, William. "The Antiposivitist Movement in Pre-Revolutionary Mexcio, 1892–1911", Journal of Inter-American Studies and World Affairs, 19 (1977) pp. 83–98. Raat, William. "Los intelectuales, el Positivismo y la cuestión indígena". Historia Mexicana 20 (1971), pp. 412–27. Villegas, Abelardo. Positivismo y Porfirismo. Mexico: Secreatria de Educación Pública, Col Sepsetentas 1972. Zea, Leopoldo, El Positivismo en México. Nacimiento apogeo y decadenica. Mexico: Fondo de Cultura Económica 1968. Benjamin, Thomas; Ocasio-Meléndez, Marcial (1984). "Organizing the Memory of Modern Mexico: Porfirian Historiography in Perspective, 1880s–1980s". Hispanic American Historical Review. 64 (2): 323–364. JSTOR 2514524. Gil, Carlos, ed. (1977). The Age of Porfirio Díaz: Selected Readings. Albuquerque: University of New Mexico Press. ISBN 0-8263-0443-5. Wikimedia Commons has media related to Porfirio Diaz. Wikimedia Commons has media related to Porfiriato. Francisco León de la Barra y Quijano was a Mexican political figure and diplomat who served as 32nd President of Mexico from May 25 to November 6, 1911. Manuel del Refugio González Flores, commonly known as Manuel González, was a Mexican military general and liberal politician who served as the 31st President of Mexico from 1880 to 1884. Before initiating his presidential career, González played important roles in the Mexican–American War as a lieutenant, and later in the Reform War as general on the conservative side. In the French intervention in Mexico, González fought for the Mexican Republic under the command of General Porfirio Díaz. He supported Díaz's attempts to gain the presidency of Mexico, which succeeded in 1876. He served as Mexican Secretary of War in the Díaz administration from 1878 to 1879. Díaz could not be re-elected to the presidency in 1880, since the basis of his coup against Sebastián Lerdo de Tejada was the principle of no-reelection, so Díaz worked for the election of his political client González, who would be weak rival should Díaz run again. His presidency from 1880 to 1884 is marked by a number of major diplomatic and domestic achievements, which historian Friedrich Katz considers to be no less than "the profound transformation" of Mexico. Although the González presidency has been considered corrupt, that assessment is colored by the difficult financial circumstances in 1884 and by Díaz's campaign to discredit his successor, paving the way for his own re-election in 1884. Sebastián Lerdo de Tejada Corral was a jurist and Liberal president of Mexico, succeeding Benito Juárez who died of a heart attack in July 1872. Lerdo was elected to his own presidential term later in 1872 rather than remaining successor due to his previous office of Chief Justice of the Supreme Court. Juárez's political rival liberal General Porfirio Díaz had attempted a coup against Juárez, but his Plan de la Noria failed and Díaz was eliminated as a political foe during Lerdo's 1872-76 term, giving Lerdo considerable leeway to pursue his program without political interference. Lerdo was more successful than Juárez in his final years as president in pacifying the country and strengthening the Mexican state. He ran for another term in 1876 and was elected, but was overthrown by Porfirio Díaz and his supporters under the Plan of Tuxtepec, which asserted the principle of no-reelection to the presidency. Lerdo died in exile in New York in 1889, but Díaz invited the return of his body to Mexico for burial with full honors. Not counting Miguel Miramón, an unrecognized president during the Reform War, he is the first president of the recognized presidents that was not born during Spanish colonial rule. The Plan of San Luis de Potosí was a political document written by presidential candidate Francisco I. Madero, who was jailed prior to the elections, and escaped to write the Plan. It was published on October 5, 1910. It called for nullifying the 1910 election of Porfirio Díaz, claimed a provisional presidency for Madero, and called for Mexicans to revolt on November 20, 1910. Bernardo Doroteo Reyes Ogazón was a Mexican general and politician. Born in a prominent liberal family in the western state of Jalisco, he served in the army, rising to the rank of general. Like his political patron, General and then President Porfirio Díaz, Reyes was a military man who became an able administrator. Reyes was one of the state governors that Díaz appointed, serving as governor of the northern state of Nuevo León. He implemented Porfirian policy, particularly eliminating political rivals, but also building his own power base. He helped in the modernization of that state, enabling local industrialization, improving public education and health, and supporting improvements in the lives of workers. While governor of Nuevo León, Reyes approved a workers compensation law. Followers of Reyes were known as Reyistas. Félix Díaz Prieto was a Mexican politician and general born in Oaxaca, Oaxaca. He graduated as an engineer from the Colegio Militar in 1888. He was a leading figure in the rebellion against President Francisco I. Madero during the Mexican Revolution. The War of Reform in Mexico, during the Second Federal Republic of Mexico, was the three-year civil war between members of the Liberal Party who had taken power in 1855 under the Plan of Ayutla, and members of the Conservative Party resisting the legitimacy of the government and its radical restructuring of Mexican laws, known as La Reforma. The War of the Reform is one of many episodes of the long struggle between Liberal and Conservative forces that dominated the country’s history in the 19th century. The Liberals wanted to eliminate the political, economic, and cultural power of the Catholic church as well as undermine the role of the Mexican Army. Both the Catholic Church and the Army were protected by corporate or institutional privileges (fueros) established in the colonial era. Liberals sought to create a modern nation-state founded on liberal principles. The Conservatives wanted a centralist government, some even a monarchy, with the Church and military keeping their traditional roles and powers, and with landed and merchant elites maintaining their dominance over the majority mixed-race and indigenous populations of Mexico. Melchor Ocampo was a mestizo by birth, a radical liberal Mexican lawyer, scientist, and politician. He was fiercely anticlerical, perhaps an atheist, and his early writings against Roman Catholic Church in Mexico gained him a reputation as an articulate liberal ideologue. Ocampo has been considered the heir to José María Luis Mora, the premier liberal intellectual of the early republic. He served in the administration of Benito Juárez and negotiated a controversial agreement with the United States, the McLane-Ocampo Treaty. His home state was much later renamed Michoacán de Ocampo in his honor. The Treaty of Ciudad Juárez was a peace treaty signed between the then President of Mexico, Porfirio Díaz, and the revolutionary Francisco Madero on May 21, 1911. The treaty put an end to the fighting between forces supporting Madero and those of Díaz and thus concluded the initial phase of the Mexican Revolution. Eulogio Gregorio Clemente Gillow y Zavala was the first archbishop of the Roman Catholic Archdiocese of Antequera, Oaxaca located in Oaxaca de Juarez, Oaxaca, Mexico. He was the key cleric in President Porfirio Díaz's policy of conciliation with the Roman Catholic Church, which kept the anticlerical articles of the liberal Constitution of 1857 in place but suspended their implementation.